Truro City manager Steve Tully has criticised his players after they drew 2-2 with Taunton Town in the FA Cup second qualifying round. The National League South side will host Taunton in a replay on Tuesday. "We were well below our standards and we're very lucky to still be in the competition," Tully told BBC Cornwall. "We had too many people off it, too many people going through the motions and when that happens it comes back and bites you," he added. 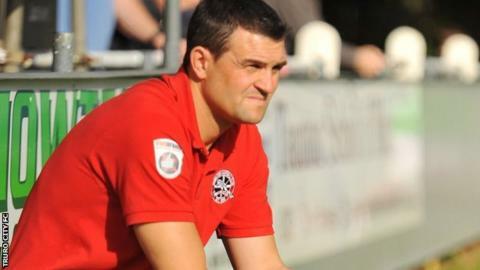 Ahead of Truro's first season back in the second-highest tier of non-league football, Tully said he would like good runs in both the FA Cup and FA Trophy. "We want to do well in this competition and we want to push on," added Tully, whose side were 2-0 up after 17 minutes thanks to goals from Craig Diff and Matt Wright. "Only Jake Ash and Arran Pugh come out with any credit, everyone else was well below their strandards and it was a bad day at the office," said Tully.